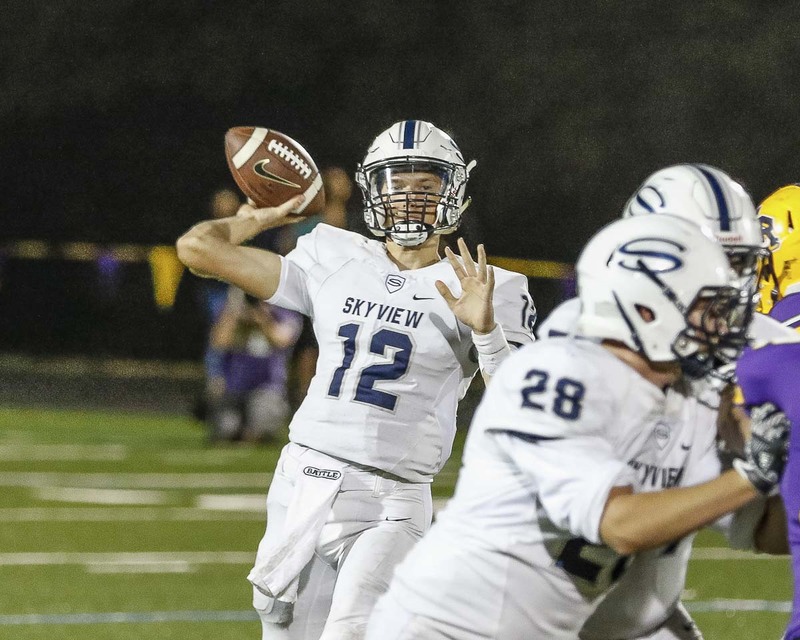 VANCOUVER — The Skyview Storm are undefeated on Columbia River’s new football field. 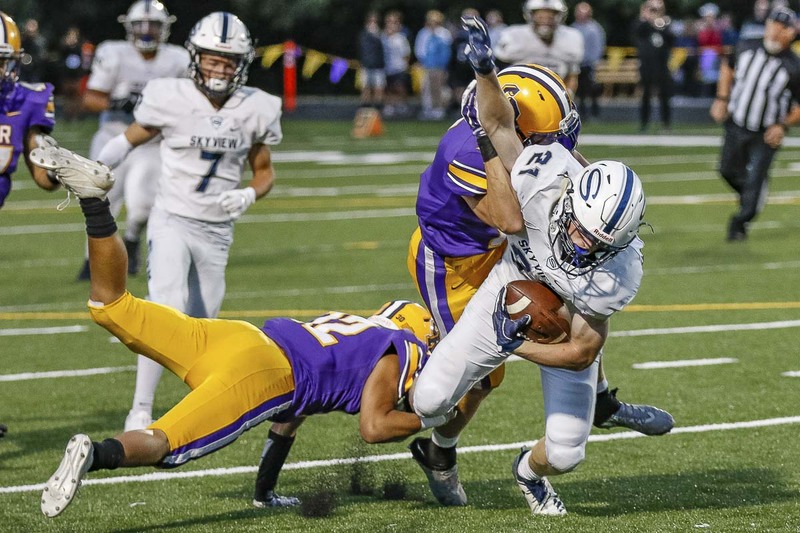 “In my heart, that was a shutout,” junior safety Cooper Barnum said after Skyview took down Columbia River 34-6 Friday night at Columbia River High School. From the very beginning, in fact. Mason Wheeler scored on an 82-yard return of the game’s opening kickoff, and Yaro Duvalko had four touchdown passes en route to the non-league victory. “We’ve been looking forward to this night for a long, long time,” Wheeler said, noting all the new varsity members of the Storm who have been working so hard in the offseason just to get to play some real football. The inexperienced Storm opened the season with a loss. But then they focused on their rivals. “This second game, we were looking for some validation,” Wheeler said. 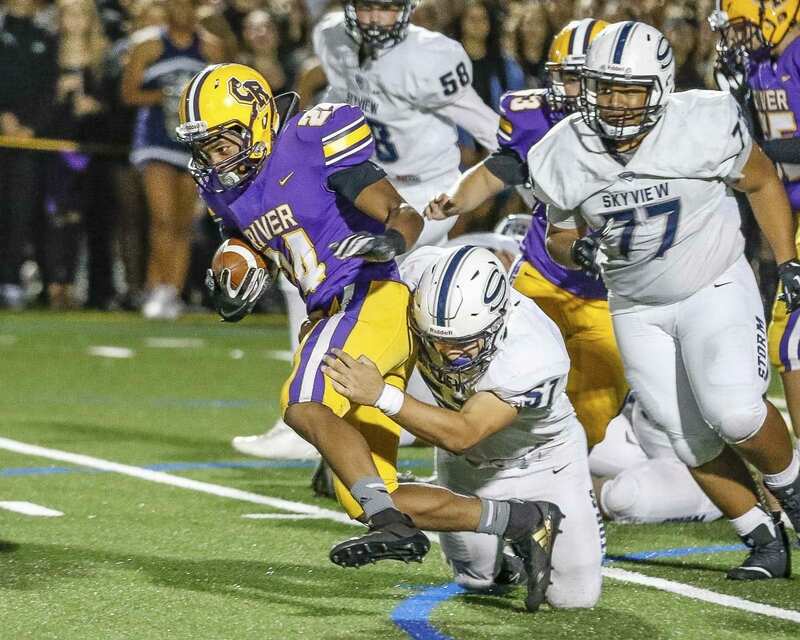 Columbia River’s Isaac Bibb-O’Neil (24) attempts to elude a pair of Skyview defenders in Friday night’s non-league game at Columbia River High School. It was 28-0 at halftime and 34-0 through three quarters. Columbia River avoided the shutout by scoring on the final play of the game. That came after the Skyview fans were penalized 15 yards for rushing the field before the game ended. Yes, even the fans wanted to be part of the new field. Duvalko completed 17 of 25 passes for 222 yards and his four touchdowns, picking up his first win as a varsity starting quarterback. Barnum used a term that sometimes gets overused in football talk. “We came out and punched them in the mouth right away,” he said. In this case, it was appropriate. Wheeler took a second to get control of the opening kickoff, made one move, and then was free for an 82-yard touchdown. Just 13 seconds into the game, and the air was taken out of the home sideline. Or, for the first time, green turf. The field is a “blessing” according to Columbia River coach Christian Swain. The Chieftains had hoped for a better performance in the team’s debut on the turf. 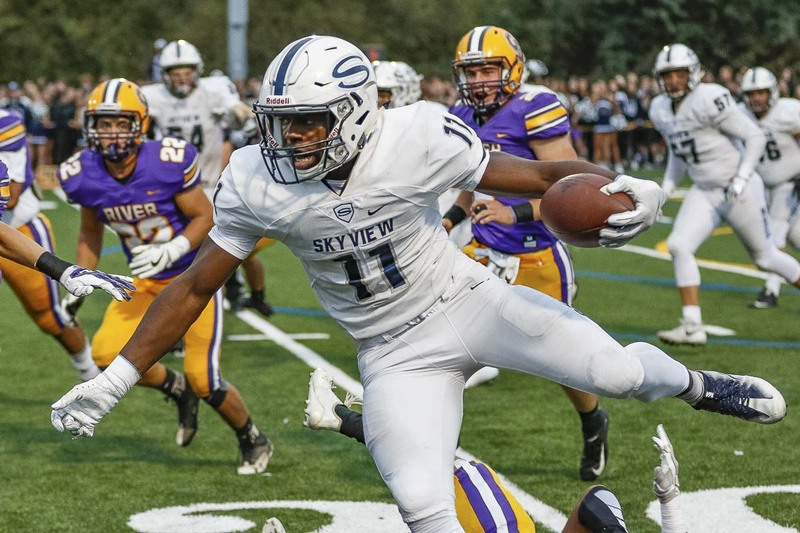 Skyview, though, was just too ready for this game. The Storm held Columbia River to 43 yards of offense in the first half. Duvalko found Gavin Baskette early and often, with Baskette catching all six of his passes in the first half for 108 yards and a touchdown. Then it was Wheeler’s turn to get in the end zone on offense rather than special teams, scoring on two TD receptions to make it 28-0. Leading to many of these scores was the rushing attack of Jalynnee McGee. He picked up 132 yards on 15 carries. Williams completed the scoring on a 21-yard TD pass from Duvalko in the third quarter. Columbia River put together an impressive 2-minute drive to get on the scoreboard. Dawson Lieurance threw a 15-yard touchdown pass to Blake Bryan, who took a big hit in the end zone but held on to the ball. Until then, it was all Skyview.